Thanks to modern technology, practicing dentistry has become simpler and more comfortable for patients. This is especially true for younger children, who may be anxious visiting the dentist. Our goal, at Dimitri Bizoumis, DDS, is to build positive relationships with children from an early age so that they may look forward to a regular check-up. Part of creating those positive relationships is using modern technology to make their experience more relaxing and enjoyable, which is why we utilize state-of-the-art panoramic digital x-rays during all dental exams. Digital x-rays serve the same purpose as their traditional counterparts and involve a sensor that is placed into the mouth in order to capture pictures of the teeth. Digital x-rays, however, are completely electronic, creating a more efficient and quicker way to receive dental x-rays. 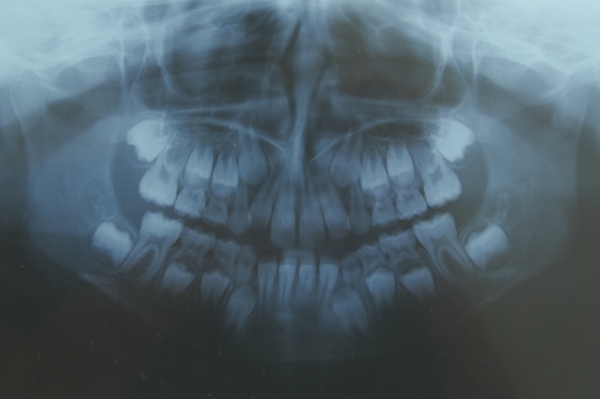 A panoramic dental x-ray is able to capture a picture of the entire mouth in a single image. Dentists can easily view a patient’s upper and lower jaws, their teeth, and other surrounding structures and determine a precise diagnosis based on those images. Higher quality: Digital x-rays are capable of being magnified without any pixilation, allowing dentists to zoom in on problem areas and gain a more accurate diagnosis. Less radiation: Many patients are uncomfortable with the amount of radiation emitted with dental x-rays. Digital x-rays use up to 90 percent less radiation than traditional x-rays. Easier to transfer: Since digital x-ray film is completely electronic, the images can be easily transferred to another doctor or specialist if a patient needs additional treatment. More efficient: With digital x-rays, there is no waiting for the film to develop. The sensor capturing the images immediately transfers the x-rays onto a computer screen for you and your dentist’s viewing. For our young patients, Dr. Bizoumis uses state-of-the-art digital, panoramic x-rays during each dental check-up. We will also use x-rays to examine any dental issues more closely. Using digital radiography allows us to diagnose problems accurately, which creates more specific treatment plans. Digital x-rays are also more comfortable for children to receive. If would like more information about digital x-rays or other services we provide, feel free to call Dr. Dimitri Bizoumis. We also welcome you to schedule your child for a dental appointment! Contact us in Huntington Beach today!